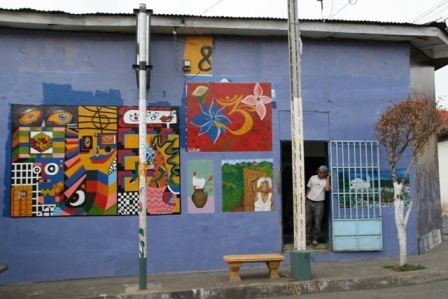 Little visited and not so widely understood, El Salvador is the country that most people shoot through on an international bus en route from Guatemala to Nicaragua or Honduras. We heard comments from others ranging from ‘its a sh*th*le’ to breathy gushings about how wonderful it was. We decided to see for ourselves, and made 3 stops, Juayua on the Ruta las Flores, El Tunco for the surf, and the capital San Salvador. El Salvador is small, just a dot on the Central American Isthmus. Many of its inhabitants rely on money sent back from family members in America to get by. The upsides of this include cash to spend, but the downsides include the fact that many people leave farming backgrounds or other labour intensive jobs to be nearer the Western Union. 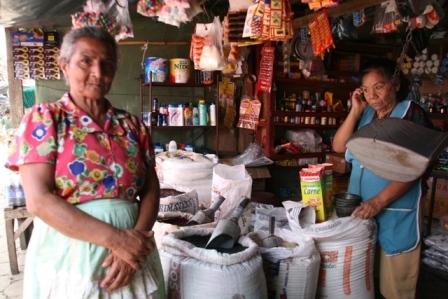 It is the most densely populated country in Central America. There is no indiginous culture to speak of, the government backed killings in 1932 in response to a peasant uprising and the long civil war put pay to all of that. 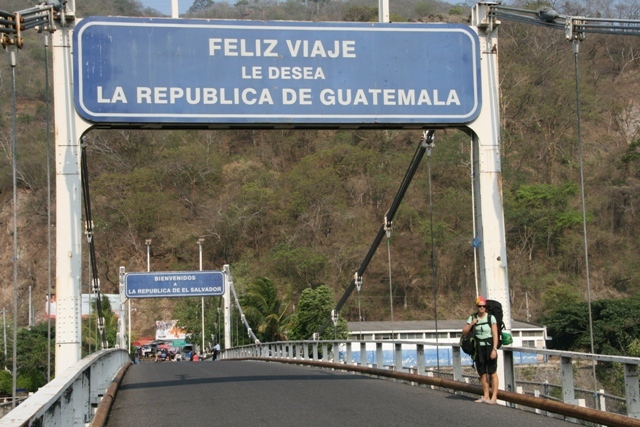 We crossed the border at Villa Nueva, Guatemala, into El Salvador. Cathal was delighted to get off one chicken bus and cross a river on foot to get into a new country, I was less enamoured with the extreme heat and weight of our loaded packs on the 600m or so journey! Our passports were checked, but the visa extension we hoped to get (there is one stamp for the four countries of Guatemala, El Salvador, Honduras and NIcaragua) was denied. This meant a visit to immigration in San Salvador city, a trip that could waste up to 2 days. Undeterred, we jumped on another bus to the town of Ahuachapan. Here we stood out like proverbial sore thumbs! I went into the ‘Super Selectos’ supermarket, and got giggled at by girls and lots of interested looks. People at the bus stop said ‘good evening’, and then good bye when getting on their bus! 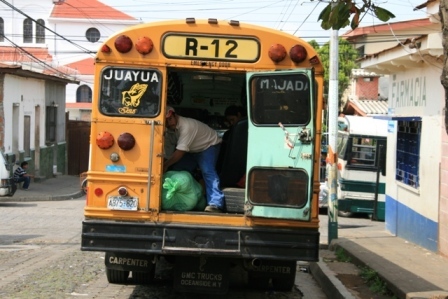 From Ahuachapan, another mad chicken bus (they are older here than in Guatemala) to Juayua. The route to this town is called the Flower Route. Peak season is October to February so all we saw was foliage! One night spent, and the town was ‘done’. Juayua is pretty, the locals are friendly and speak a surprising amount of English, but due being there out of season there wasn’t much else to keep us there.